(Nanowerk News) When you're merging onto the Beltway around the nation's capital, you want to go from 20 to 70 mph now. Supercapacitors, often built from a two-dimensional material called graphene, have the potential to provide electric or hybrid cars with the energy needed to safely merge into traffic, but different studies of the devices' performance give almost random performance data. The suspected culprits were tiny flaws on the graphene electrode. But, what, exactly, was happening? A trio of scientists at Pacific Northwest National Laboratory (PNNL) found that two groups of atoms were slipping onto the surface and causing ions to stick, keeping charged particles from doing their job of storing and releasing electricity ("Effects of Oxygen-Containing Functional Groups on Supercapacitor Performance"). Future cars could contain supercapacitors and batteries, but no gas tank. If you want to accelerate quickly, the supercapacitor will give your car a boost. The battery will provide the constant energy for regular driving. Braking will channel energy back into the supercapacitor, recharging it. Understanding what happens inside graphene-based supercapacitors, specifically the graphene electrodes' capacitance, or ability of ions to congregate on the surface, gives scientists insight to design devices that can improve electric cars' acceleration. In the scientific literature, capacitance values for graphene electrodes were not consistent. The team wanted to know why the values differed. 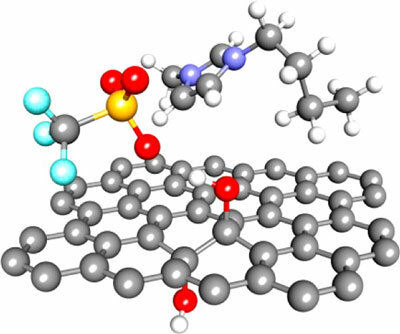 Funded by the Laboratory Directed Research and Development Office at PNNL, the team used molecular dynamics simulations to examine the electrolyte ions as they interacted with the graphene sheets. Based on that ion distribution, the team was able to determine the electrical charge or lack thereof on the electrodes. The team is now working on building supercapacitors with specific defects to determine how the electrode and electrolyte behave. Their goal is to build a supercapacitor with one specific type of defects and an electrolyte that lets them control the defects to see if they can get the material performance needed for faster acceleration in electric cars.